If you want the ultimate expedition, this is the one. 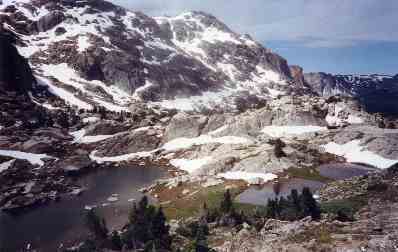 The Wind River Range is the largest intact mountain wilderness remaining in the lower 48 states. It has everything. 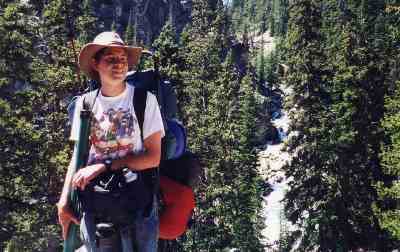 It's the Final Four, the World Series of backpacking. You will talk about it the rest of your life. But this is a trip for experienced backpackers. You need planning and conditioning. You'll face high winds and nighttime temperatures below zero. On a typical week long trip one day of snow is almost certain. For starters, you need major league equipment. You need large capacity packs, because these are long trails, and you will be out for seven days or more. You need expedition tents, built to handle snow, ice rain, and wind. You need down parkas, down bags, and rugged rainwear. You need stoves which function at high altitude in high wind and low temperatures. You need gloves, hoods, face masks and long underwear. You need experience in stream crossings. In your first aid kit you need plenty of sunblock, and everyone should apply it several times a day, because in the high, thin air the sun can burn fast. If you come to the Wind Rivers every year, there are many options, but on your first trip, we highly recommend the classic Squaretop Loop, often called Circling The Square. This is a seven day hexagon around the base of Squaretop Mountain, and it will give you a little taste of everything the Wind Rivers offer. It avoids the need for shuttles or backtracking. 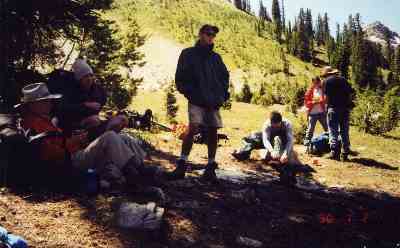 And it offers a great forest service campground as a starting and ending point. It's a three day drive to the Wind Rivers. We recommend going out the northern route, meaning up through Indianapolis and Peoria to I-80 at Rock Island. You'll pass the University of Illinois and Iowa and you can drive through, but don't dawdle, because you have a lot of miles to cover. We stop the first night at Timberline Campground, at Waukee, Iowa, just west of Des Moines. You'll arrive at dusk, so calling ahead (515-987-1714) is a good idea. Timberline is a few miles north of I-80, in a grove of trees surrounded by farmland. There are thick, grassy campsites, a pool and store, and excellent showers and rest rooms. Second day you'll push into Nebraska, where a brief stop at the University of Nebraska in Lincoln, its cavernous football stadium, and the magnificent state capitol building, is worth it.West of Lincoln, you'll enter the cattle empire, with its windmills and changing landscape. 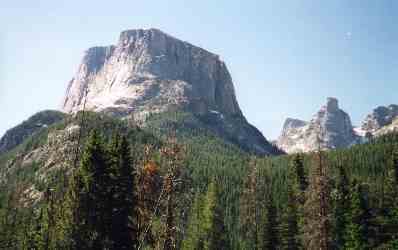 We love to stop the second night at Vedauwoo Campground in the Medicine Bow National Forest halfway between Cheyenne and Laramie. You'll set up just below 12,180 ft. Mt. Zirkle. 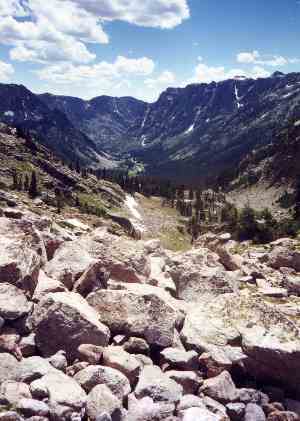 You're high in the Medicine Bow Mountain Range, and this will be an introduction to The Big Country. There are no showers, you'll be whipped by strong winds, and temperatures will drop to freezing at night. But your hardiness will be rewarded by views of peregrine falcon, osprey and bald eagle overhead, and various four footed denizens checking out your camp. If your group includes many veteran rock climbers, you may want to schedule an extra night here, because this is ranked one of the best climbing sites in the country. The Medicine Bow Wilderness contains 2.2 million acres and is so named because the Native Americans thought wood from here made the best bows. 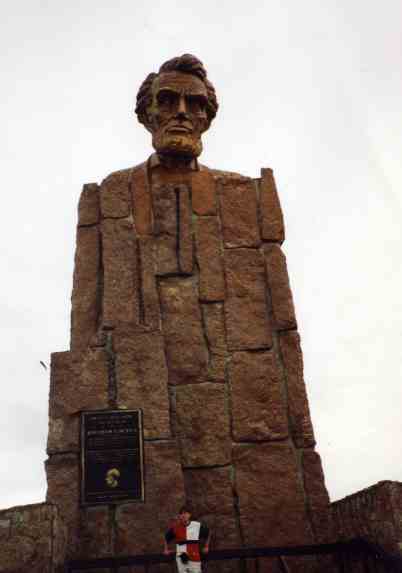 You'll also see the monument pictured at left, marking an adventure the history books skip. Abraham Lincoln invested in the Union Pacific Railroad, and he and a group of fellow investors rode the railroad West to see how their money was being spent. The track only went to the top of the Medicine Bows, so they camped for two nights, then reboarded their chartered passenger car and headed home. Third day, you'll pass Laramie and the University of Wyoming, a possible brief stop, then head on across the Red Desert. Exiting the interstate at Rock Springs, you'll reach Pinedale by late afternoon, where you can stop to pick up your backcountry permits and make any last minute purchases. Then you'll drive west, turn right (north) and head 52 miles up the Green River. The paved road will turn to gravel. Slow down, to avoid damaging your vehicle, and to watch for moose or other animals crossing the road. 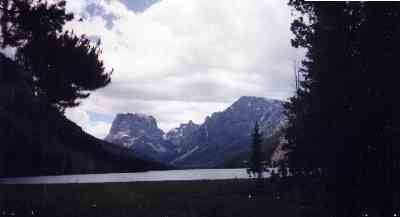 At slowed speed, you'll take over an hour to reach the Green River Lakes Campground at the end of the road. We spend two nights at this campground and hike east to Slade Creek Falls and north toward Roaring Fork while everyone's body adjusts to the altitude. Or, you could fish the lake and river. 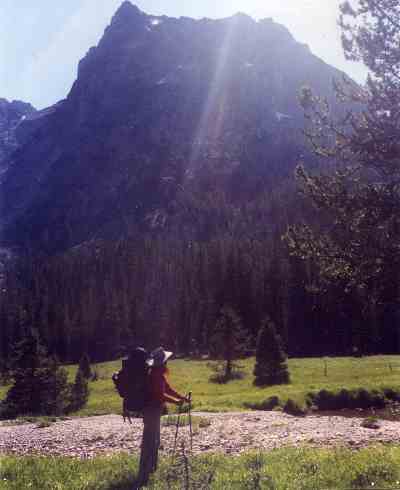 Then, on the fifth morning of your trip, you finally head out on the Highline Trail. 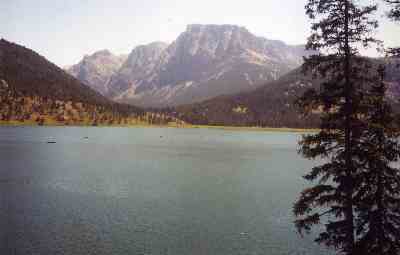 It goes all the way to Sandy Lake Lodge, but you'll hike it only as far as Three Forks on the second day. Those dayhiking trails were scenic, but when you cross this footbridge (left), you're heading into the wilderness. The first day, you'll be following the north shore of the river, so the trail will be almostly perfectly level, which is fine, with your bodies still adjusting to altitude and leg muscles limbering up. We recommend camping at White Rocks that first night. 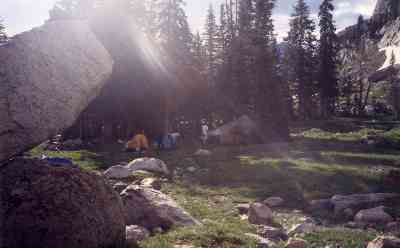 It's a scenic little group site, with individual tents pitched among huge boulders. There are various niches in the rocks that make for fine sitting, and you will have great photo ops of sunsets and sunrises out over the water and the mountains. There's good fishing up and down the river. The second day you'll hike a few more miles along the river, then cross the last footbridge and start climbing. There is water everywhere, in the river, sidestreams and small lakes, so swarms of insects might annoy you here. DEET or other sprays are a strategy, but we prefer netting. You'll need it when you stop for lunch at Three Forks. Some people get so aggravated they pitch their tent to eat lunch in. From Three Forks on, you'll encounter several stream wadings, so have your river shoes available. 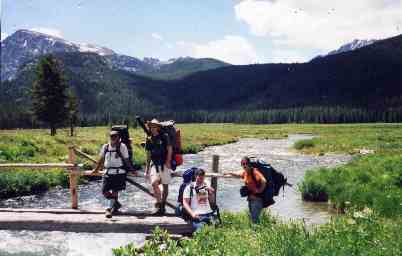 According to Forest Service statistics, stream crossings are the leading cause of backpacking injuries in the Wind Rivers. The bottoms are rocky and slippery and the water is cold. fast moving and powerful. 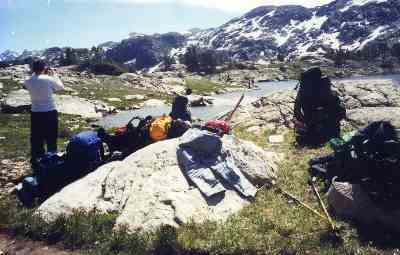 By late afternoon, the trail begins a long, very steep uphill, and a camp site is on your left along the water. This is our preferred stop for the second night. 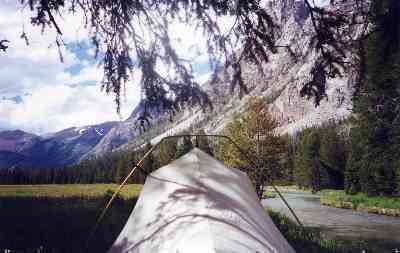 It offers the view shown to the right, good fishing, lots of firewood, tight but level sites and, thankfully, no bugs. We could stay here for a few days. Next morning, you'll begin one of the epic climbs of the trip. You climb continuously for six hours. No levelling out, no brief downhills. Just up. And you're in tree cover, so there are no views. The only breaks are a few difficult stream crossings, where the water is narrowed, thigh deep, moving fast, with a sharp rocky bottom. With a pack on keeping your balance is a challenge. If you don't carry trekking poles, find a temporary hiking stick from the deadwood laying along the stream from early summer floods. 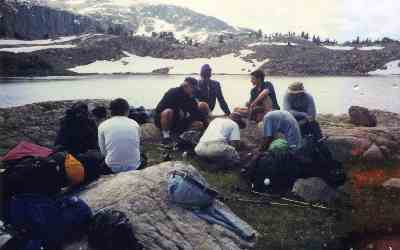 This is a good place for team building, as helping each other is essential. Remember to use three points---two feet and a pole---and always have two firmly planted. Hiking sticks give you four points, with three always planted. Falling in means building a fire to warm up and dry out, changing clothes, and an hour's delay. You'll eventually come out at the top, and find that the stream you've been crisscrossing flows out of Clark Lake. You want to keep left (east), where the trail meanders along the shoreline for another mile. 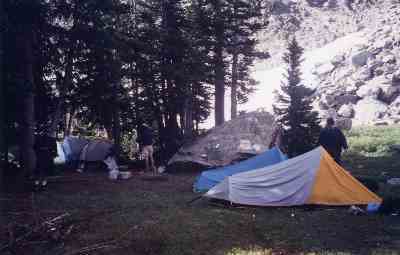 But the campsite at the top of the lake (right and below) is worth the day's effort. It's one of those classic Hollywood spots where you could spend at least a few days. We've talked to people who hike up every August, camp here for a week, fish in this lake and another dozen within a mile or so in every direction, and just enjoy the scenery. There's lots of firewood and the trees, boulders and steep sides block the wind. But there's a price. We woke up to heavy August snow the next morning, beautiful but 20 degrees. We snuggled down in our sleeping bags and went back to sleep until the bright sun warmed things up around 9 a.m. Dave's pancakes and coffee stoked everybody's fires, so we struck camp and headed on. The day begins with another challenging climb, to Greeley Point. Just before dropping into the next valley, we paused to look fondly back on our spectacular campsite, shown at left. If you look carefully, you can see the trail winding up toward us through the middle pine grove. But the next valley is equally dramatic. 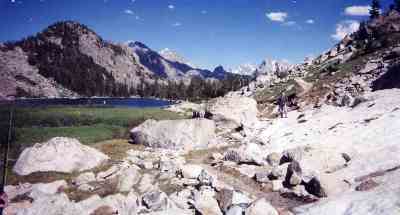 It is alpine tundra, a vast treeless expanse of boulders, lakes and snowfields. This segment of the trip is the primary reason this is best done in July and August. 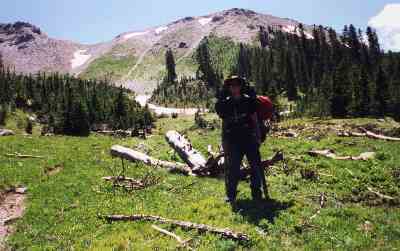 The snow melts late here and begins falling again early, and you'll be snowshoeing rather than backpacking. We did face one stretch of a mile and a half where we were struggling across snow with crampons and ropes, and it was slow going. But in June you'll face a long seven or eight hour day of it. For kids on their first expedition, we much prefer solid ground. The three photos below are taken consecutively, and show the landscape in all its stark beauty. 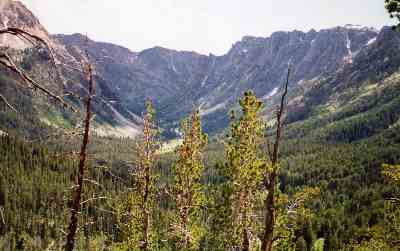 The trail at this point is at 11,000 feet with the surrounding peaks ranging from 12,000 to 13,000 feet. 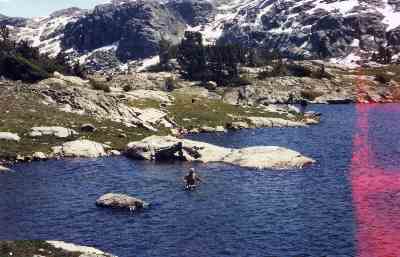 By about noon we arrived at Lozier Lakes, a half dozen small lakes teeming with fish but just above freezing. 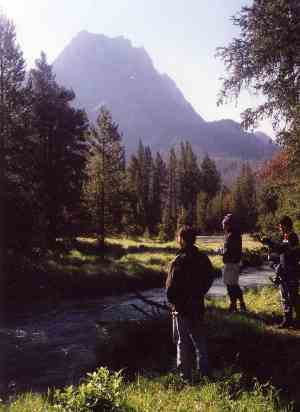 On some of our expeditions, we've camped here, because passes in both directions allow side hikes and the fish provide several fresh, hot meals. But on our most recent trip we just stopped for a long lunch break. Our fishermen changed into swim trunks, waded out into the largest lake and caught a few dozen trout while our cooks unpacked the stoves and cookware and set up the kitchen. Fileting and frying the fish was quick and efficient, and no backpacking lunch ever tasted better. Fortunately for our fishermen, the sun was warm, no wind was stirring, and the boulders were toasty from the rays. So they were able to quickly recover from their dip in the icy water, and swim trunks hung from the outside of packs dried during the afternoon. 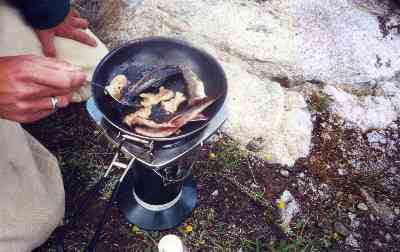 Once we had washed down the fresh trout with hot spiced tea (see photos below), we packed up and hit the trail again. And again, the scenery changed. 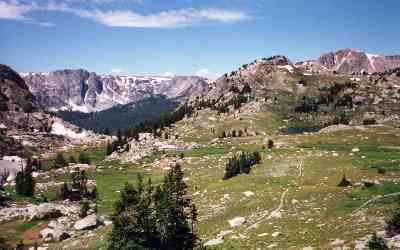 From Lozier Lakes, the trail drops steadily down for the entire afternoon, heading into the valley you see at left. This is the New Fork drainage, which has its own set of trails and can be entered from New Fork Lakes for an entire week's trip of its own. Our route only spends about 24 hours in this watershed, and with two exceptions, it's a very relaxing one. 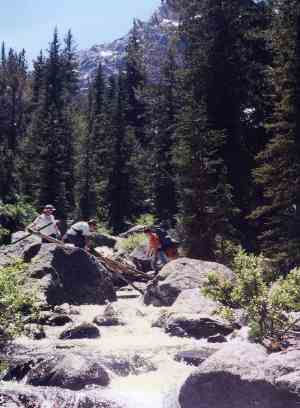 The first exception comes just below the rim of the picture to the left, in the form of the very tricky stream crossing shown on the right. You reach this point about 90 minutes below the lakes, and what makes it tricky is the snowmelt water is actually below freezing but kept from freezing by its rapid flow. However, all rock surfaces underwater and surrounding the stream are ice. You thus cannot get solid footing, and the powerful flow of the narrow stream can sweep you off your feet. The stream is not very wide, but it poses a serious obstacle and you cannot afford a major fall and serious injury way out here. On these rocks, some of which have very sharp edges, it would be very difficult to slip and not suffer the consequences. Once again, team building is necessary. Everybody has to help everybody across. Once the crossing is completed, this would be a good place to purify water and fill canteens. The second exception comes an hour further on down the trail, as you begin a switchbacking descent to Dodge Creek. In addition to the knee pounding two hour long decline, you must also contend with a dozen trees blown down across the trail. 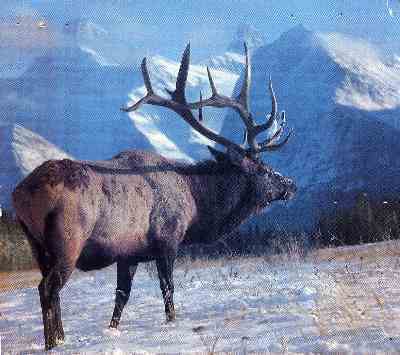 You must either climb over, crawl under, or bushwack around these giants. When you finally level out at the bottom, it's definitely time to look for a campsite. We like the one at the head of Dodge Creek, just before the trail begins a steep ascent out of the trees up to Porcupine Pass. 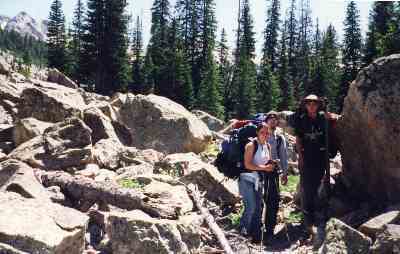 The campsite is to the left of the trail, a level ledge which catches the sun and has the creek nearby for water. Dodge Creek is also a great trout stream, and those fish, fileted and fixed only minutes out of the water, really hit the spot after this long and challenging day on the trail. It's also a good night for a roaring campfire, because the most difficult part of the trip is over. And we love these campfires. Sometimes we think we learn as much around these campfires out in the wilderness as we do in all the classes we sit through back at school. We've gotten pretty deep into history, philosophy, ecology, and even music and literature. There's something about snuggling down into a rock or log niche, sipping a mug of hot tea or lemonade and listening to the wind whispering through the pine trees that sets up a very contemplative mood. But don't intellectualize too much --- you have two challenging days to go. New Mountain is 11, 850 feet. 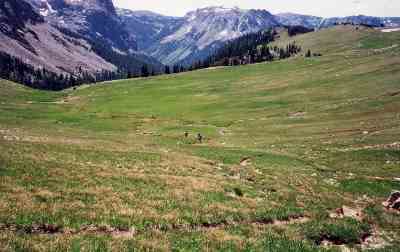 Porcupine Pass allows the trail to cross the divide at 11,000 feet. 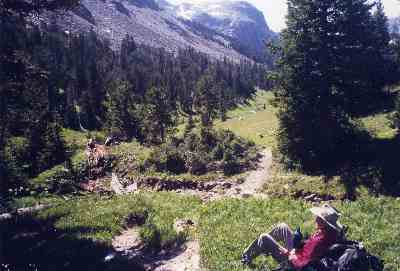 But the campsite is down along the creek at 9500 feet. 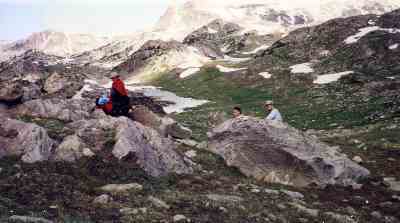 So the next morning offers a three hour climb back up to ice, snow and alpine tundra, a hairy switchbacking descent through rocky scree and snowdrifts, a lunchtime stop at one of the Wind Rivers' major avalanche paths, and a three hour hike through the valley with six stream wadings. Keep the camera handy, but you'll be adding clothing layers on the way up and peeling them back off on the way down. The center photo below shows the long winding trail heading up to Porcupine Pass; look closely and you can see the hikers. Last night's Dodge Creek campsite was down in that valley far in the distance. 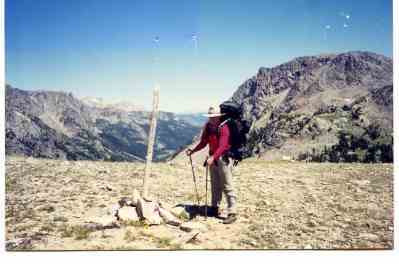 Above right is the marker at Porcupine Pass. From here it's a two day downhill hike to the van. 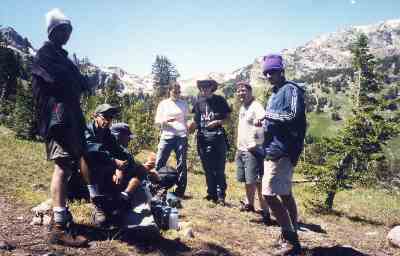 Above left is the group pausing for lunch after coming down the Porcupine Switchbacks. To the immediate left are three of us crossing the avalanche zone, not a risk in July or August but very dangerous in late Winter. Notice now that we're back down in the valley it's t shirt weather. The trail from here levels out to a gradual descent through one of America's most beautiful valleys, with only frequent stream crossings to interrupt the pace. Battleship Mountain looms huge to the left (southwest) as you hike, and is the peak shown to the left of the title at the top of this page. 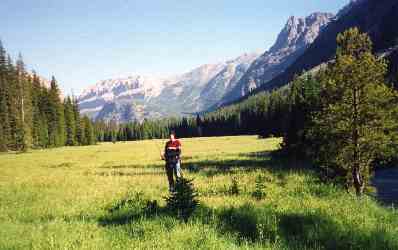 The trail alternates between stretches of deep forest and expanses of open meadow, with Porcupine Creek splashing and gurgling along the way. 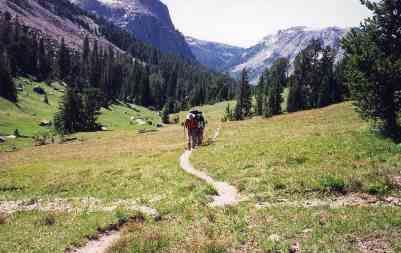 There are numerous acceptable campsites along this trail, but we recommend pushing on to the ideal one at Twin Lakes. Perfectly level, in the forest but looking out over Porcupine Meadow, it offers great evening wildlife watching. 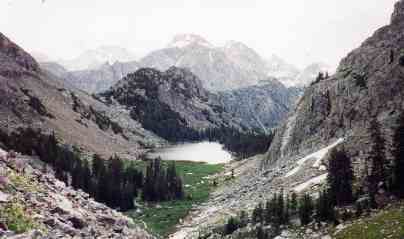 Twin Lakes is also the last night out on the trail. 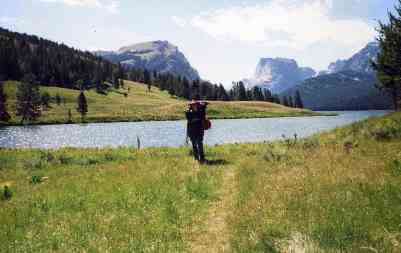 Next day, the sixth, will bring you back to the Green River Lakes Campground. Whether you stay there for one last night in the wilderness, or head into Pinedale for a hot shower and restaurant meal, is a decision you can discuss over the evening meal at Twin Lakes. But even that final day on the trail will have its moments. You'll begin the day with yet another tricky stream crossing, and within half a mile reach Porcupine Falls. Soon after, you come out on the shore of Green River Lake, but this is the opposite shore from your trail out a week ago, so you have a whole different angle for photos. week, we check out this ranching and wilderness outfitting village of 1100. There are enough stores and shops in just a few blocks to create some competition, so by mid or late summer you can pick up great equipment buys. Several little rock shops and western wear outlets are fun to browse. There's the Museum of the Mountain Men, worth an hour or so. And the art galleries and superb bookstores always make us wish we had an extra hundred dollars. We usually walk a block off the main drag to check out the kindergarten through 12th grade school. This may be a small and isolated town, but the school is obviously richer than anything we see back home. We walk the back streets a few blocks and check out the houses, mostly heavy log structures designed to survive long, bitter winters. We meander back to Main Street, stop at the ice cream shop for a big cone after a week of freeze dried food, and sit on the benches watching all the cowboys. Last time we were here we saw a moose walking down the street. But the highlight of the day is always the evening meal at The Stockman, the old hotel and restaurant in the middle of town (307-367-4563). Never mind that it looks like John Wayne ought to walk in any minute. 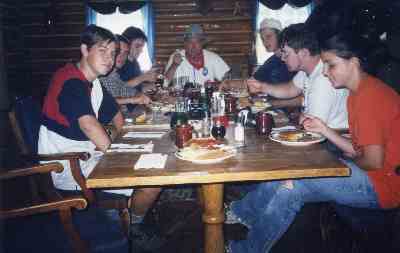 They serve elk, antelope, moose, buffalo, trout and traditional grass fed Wyoming steak. A menu from The Stockman may be one of the trip's best souvenirs. Early next morning, we sort of sadly depart Pinedale. But the adventure's not finished. If it's the first week of August, we recommend visiting Cheyenne for Frontier Days, the top stop on the national rodeo circuit. Most of our readers are from Kentucky or somewhere in the South, Midwest or East, meaning you have probably never seen a really big time rodeo. This is the one to see. All the best riders and animals in the nation are here and the facility is beautiful. They also stage an impressive parade and one of the nation's biggest concerts. We've seen The Beach Boys, Credence Clearwater Revival, Three Dog Night and other classic groups at Frontier Days. As a matter of fact, we stood next to the governor of Wyoming and his daughter watching Credence. Kids who were on that trip still come back and talk about it. We like to drop from Cheyenne down to Denver, pick up I-70, and camp at the Lawrenceburg (Kan.) KOA. From there, it's an easy day through Kansas City and St. Louis back to Lexington on I-70 and I-64.